Audi`s all-new 2016 Q7 reveals a handsome albeit somewhat familiar look for the new Q7, but while the exterior may not have changed much, engineers have totally re-vamped things. Using the Volkswagen Group`s new MLB Evo platform, specifically the SUV version of the platform. The platform is an evolution of Audi`s existing MLB structure where ultra-high-strength parts made of hot-shaped steel form the backbone of the occupant cell. How much lighter is it? A substantial 325 kgs lighter in 3.0-litre TDI trim as an example. The 2016 Q7 TDI measures in at 2000 kgs making it one of the lightest options among seven-seat SUVs in the premium segment, but at the same time it's one of the most spacious in the range despite external dimensions being lowered. The big SUV is 3.81 cms shorter and 1.52cms narrower but with the same height. Space between the first and second row of seats has been increased. The third-row seats are better-suited to children and small adults. 2016 Audi entry-level option is a 2.0-litre TFSI, joined by two V-6s, a 3.0-litre TDI plus a 3.0-litre TFSI. All 2016 Q7s will come with an eight-speed S tronic automatic transmission. Further down the track Audi will add a plug-in hybrid combining a 3.0-litre TDI with an electric motor which will return a combined fuel economy of 1.4 litres/100 kms travelled. 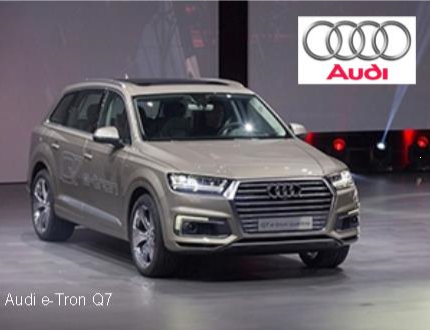 The Audi e-Tron Q7 will also be the fastest in the range doing 0-100 kmh in just 6.0 seconds and will accelerate to top speed will be a tick under 226 kmh. A quattro permanent all-wheel-drive system remains standard across the 2016 Q7 range, but one major new feature is all-wheel steering. At low speeds the rear wheels steer opposite the front wheels, making the vehicle more manoeuvrable for parking, and at higher speeds the rear wheels follow the movement of the front wheels to aid stability. This works in conjunction with an electrically-aided steering system.